With a selfie (and a photobomb). Kaitlin and I watched the peach as it dropped with some friends, and snapped a photo when the new year came. 2015 began, and proved to be a year of adventure, change, and blessings. Two days later, on January 3rd, I visited my dad on his birthday. 2015 would be my first full year without him, and though he’d been gone for nearly a year at the time, I hadn’t really even really begun grieving. I have trouble allowing myself to do that, and though I made it a new years resolution to do so, it never really happened. It’ll remain a goal of mine for 2016. Soon afterwards, I marked an item off my bucket list: finally beating “The Legend of Zelda: Ocarina of Time”. That game is quite easily the greatest video game in its genre of all time, perhaps second only to “A Link to the Past.” Anyway, that’s enough geek for one post. Our family soon grew by a few hands when I (with the help and generosity of our friends at Cobblestone Crossing School of Horsemanship) was able to give Kaitlin a baby horse for Valentine’s Day. The two had quite an amazing bond, and raising a baby had always been a dream of Kaitlin’s. It’s amazing to see how far they have come in their relationship since then! The next day, she had her first lesson with him. We named him Koda Bear. Then, we set off for Pigeon Forge, Tennessee for our Valentine’s Day retreat! Nothing beats a dinner at the Old Mill and a few days to just relax and have fun together. While I was there, I gave someone a fake parking ticket. They deserved it. To see more of my parking ticket victims, search the tag #parkingticketsfromzack on Instagram. It also snowed in February, and we made the best snowman in our history of snowman making together. It doesn’t snow often in Rome, GA, but you can tell it wasn’t our first rodeo. Meanwhile, as a middle school teacher, I discovered how fun writing tests could be. Also, I learned that middle school kids nowadays don’t know who Keanu Reeves is. They better watch out, though. That guy knows kung-fu. In March, I received my acceptance letter from Shorter University’s School of Nursing. I talked a whole lot more about my journey to making nursing my career in a blog post titled “Finding God’s Will“. Needless to say, this marked a turning point in my life. We found this baby squirrel outside, after a neighborhood cat killed its mother. We nursed it back to help and was able to take it to a friend who rehabilitated it! As far as we know, it was released back into the wild a healthy squirrel. On April 21st, we celebrated 7 years of being a couple! It’s amazing when I think about being together that long. That’s over a fourth of our lifetime spent on this God-written love journey. I’m a lucky man. Four days later, my brother-in-law married his best friend (who happens to be the sister of one of my fraternity brothers from college. Small world! ), and we (Kaitlin and I) got to be apart of the ceremony. Immediately afterwards, I broke my wrist in a fall at the church. Which was a big wake-up call for me, honestly. It was my second fracture in two years, and though my first was not due to my own actions, I still had to realize that I’m not invincible. Never having a serious injury as a child or adolescent, I never really had to think about the possibility of my actions leading to serious harm. For my birthday, Kaitlin took me geocaching and to a Braves game! She’s the best. I saw my little brother walk for his high school graduation. And now he’s in college. Life happens so fast! 1997 doesn’t seem too long ago, and I can vividly remember the day my father told me I was going to have another little brother. Kaitlin and I traveled to South Carolina to our friends wedding. I began working at Starbucks, solidifying my physiological dependence on caffeine, and introducing me to a phenomenal company and crew. I am lucky to work here. Also in June, I baked my last batch of bread for Rome, Ga’s Great Harvest Bread Company. The company was being sold and would no longer be a Great Harvest franchise. I never worked anywhere as long as I had worked at the bakery, and I owe a considerable amount of my growth as an employee and a person to my time there. Nothing compares to making bread from scratch, and I continue to do so in my home from time to time. On June 18th, our marriage turned four years old! We weren’t able to be together that day, but it was special nonetheless. Marriage has blessed my life more than anything I have experienced since receiving my salvation in 2008. God has taught me more about myself and about love through the covenant of marriage that I can put to words. I love this girl! I’m grateful I get to grow old and do life with her. Every moment is meaningful. Every July 4th, Kaitlin’s family tries to have a beach trip to their new retirement home in Yulee, Florida (about 15 minutes from Amelia Island). Later in the summer, I took Kaitlin to Charleston for a birthday getaway trip, where we enjoyed restful time at the beach, explored Market Street, went on a sunset kayaking tour, and ate some amazing food. It was a fun-packed time, for sure! When August hit and nursing school officially started, life began to change. Facial hair disappeared. Exams covered countless chapters of material. But I still enjoyed (and continue to) knowing I was on a path that God designed me for. In the end, I was working hard and studying not for myself, but for Him and for His people that I would soon be serving with a new set of skills. Awkward-faced lunch break selfies became the new thing. My mother turned 29 again! So I took this picture of her and my brother. He made that face on purpose. I received my white coat, which I never actually wear. I do love and appreciate the symbolism of it, though. We joined Kingdom Valenia at Going Caching 2015, a geocaching mega event. We took a trip to see Amicalola Falls while the leaves were changing color. Gorgeous. All-nighters with notes spread all over our living room also became the new thing. Thanksgiving and Christmas brought family together. Not being able to see them much due to school and work made it extra-special this year. 2015 ended the way it started: a selfie. We bought a selfie-stick and used it to take a family picture with all our animals for the Christmas card. It was a greater challenge than we expected, but we eventually got it. Sorta. My dad always told me not to forget to wash my car or change the oil. One of the very last memories I have of him involved him teaching my brother and I how to change the oil in a car by ourselves. He had stage IV cancer, was on oxygen, and yet, during a cold winter day it was important enough to him to get outside and walk us through it. Ever since, I make sure I get the oil changed every 3-6k miles in my car and my wife’s truck. 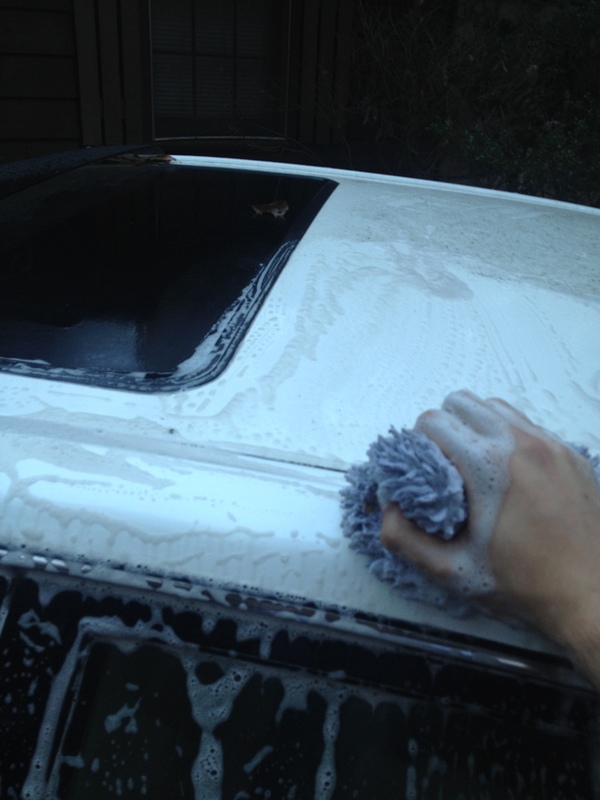 Washing my car, though, is another story. No matter how much he told me to keep my car looking nice, I tend to keep it on the back-burner. If you saw my car lately, you probably wouldn’t have described it as Diamond Pearl. You’d think of it as more of a… Tree-Sap-And-Bird-Poo Grey. Embarrassing, really. I went to my first hospital clinical rotation today, and I don’t know if I was more anxious about seeing patients for the first time or the possibility of someone wanting to carpool with me. So, I made it a priority to wash it today, and I was amazed at how much junk had built up and how harder it was to wash it all off compared to if it had been just washed a week or even a month ago (instead of only-the-LORD-knows-how-long ago). Sometimes, I treat my faith the same way I treat my car. I go days or even a week without really sitting down with the Father. Junk builds up – some of it without me even knowing. It gets harder and harder to face Him because I’ve gotten out of the routine of it. I start to realize I’ve slipped a little off the path. When I finally pour my heart out to Him and ask Him to forgive me and guard my heart against the Enemy, I feel so much relief and peace. A burden lifts off my shoulders and Jesus washes my junk away. Not all routine is legalism. My faith could use some routine. Just like how washing my car regularly prevents me from having to scrub so hard to get the junk off, maybe if I came to Him regularly, my junk wouldn’t build up so much and it wouldn’t get harder to get over myself and face God with my imperfections. We all need Him daily. We have to fill up on the Spirit if we’re to pour His love out to others and guard ourselves against the Enemy. Praise be to God, though, that even when I fall… even when I fail to seek Him daily, He still is faithful to forgive me. Jesus said on the cross that “it is finished,” and he meant it (see John 19:30). How amazing is that grace? I am so undeserving. Sin left a crimson stain. Thank you Jesus, for Your amazing grace. When I was a boy, I had trouble keeping up with things (that hasn’t changed much, but we’ll leave that for another day). 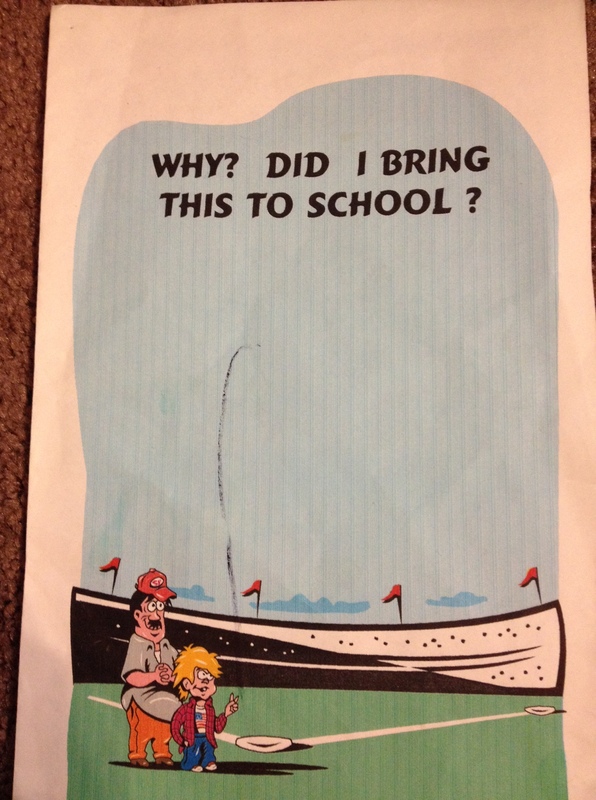 A particularly bad habit of mine was leaving my school books and/or homework at home. This usually meant I would have to call my dad and ask him if he could bring it to me. Fast forward a few decades, and I can understand how this could get really old for him, really fast. And it did. Whatever was coming, I definitely dreaded it (though I deserved it). We didn’t get grounded growing up. I didn’t know what that even meant until some kid in middle school told me. We got punished the old-fashioned way. You know, like with a belt (or whatever my dad could find, or his bare hands). My dad didn’t mess around. He set us straight. The right way. So I put off making a phone call, thinking “Maybe she will forget to ask for the homework today.” Which actually did happen sometimes. And I loved it. Some kids hated it and would even remind the teacher if it got close to the end of the class. Every class had one of those kids. No offense if you were like that. I understand now. College Zack puts a lot of work into papers and such and feels like he wasted time if its not taken up. I get it now. But elementary Zack was different. To elementary Zack, a teacher forgetting to collect homework that was left at home was amazing grace, for sure. It wasn’t very long at all into the school day, though, that I was called to the office. Contrary to how I’ve made my past self seem, this was not a common occurrence. Having to tell my dad that I got in trouble and I left my homework at home was just too much. I was about to die. For real. Amazing, undeserved grace from my father, in the form of a home-made card and the stuff I forgot. I was expecting (and deserving of) him to be upset and to give me consequences, but instead he chose to give me grace. He saw that I had left my books and homework at home, and brought it to school before I could even call him about it. 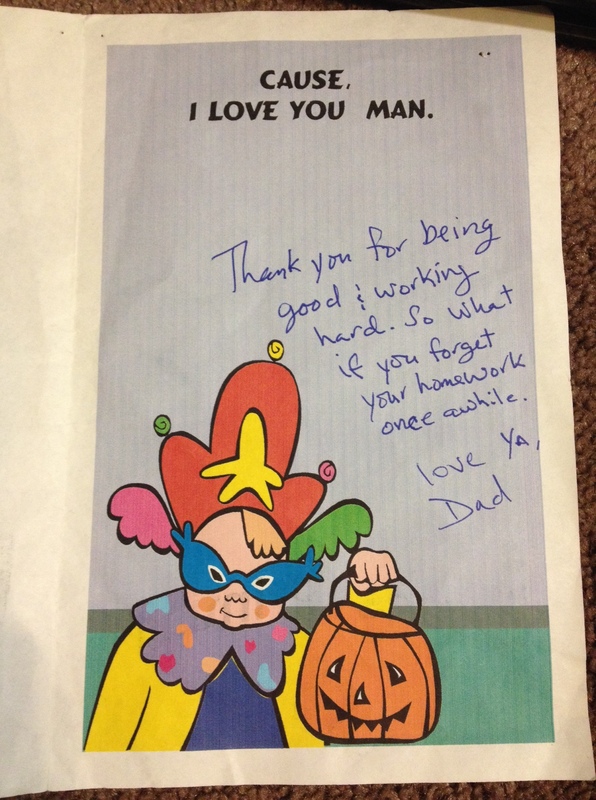 Nearly twenty years later, coming across this still gives me that feeling of relief and love for my dad. But it also makes me ask myself: Do I show grace to people when they would least expect it? When people are anticipating that I’ll blow up at them or judge them, do I live up to their expectations or surprise them with grace and understanding? Grace that amazing is meant to be shared. How can I say to Jesus that I’m thankful for His grace if I don’t treat others with that same grace, understanding, and love? The sad reality of the American church is that too many groups of people expect to be judged and/or mistreated by Christians. Lately, it’s been my conviction to make sure I don’t contribute to that. Christ saved me from God’s wrath. No one should be afraid of mine2. 1 Allosh is the nickname often given to kids whose name is Ali. It is what my dad usually called me, even as a young adult. 3 Jk. I’m working on it. But seriously, don’t. While there are so many shows that I openly and proudly express my appreciation for (Monk, White Collar, The Andy Griffith Show), there are also those that I hesitate to admit to liking. Guilty pleasures, to put a dramatic label on it. We all have them, right? I think this may be the most ridiculous show I have ever seen; I guess I’ll just have to endure this for the sake of spending some quality time with my incredible wife. None-the-less, I gave it a shot. A few episodes in, and the unimaginable happened: I became hooked. I know you’re judging me right now. It’s a great show, I swear. You just don’t even know. And that’s okay.